Close to Williamsburg, Virginia, Royal New Kent is set upon the low hills between Diascund Creek and the Chickahominy River. 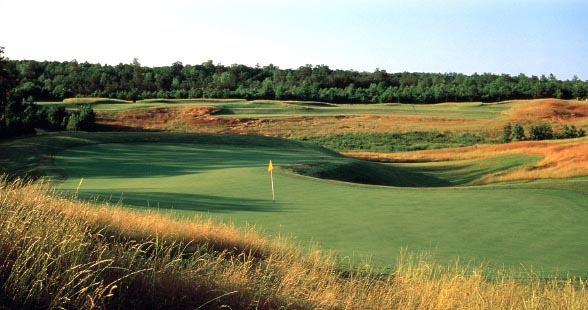 In 1997, Royal New Kent opened to outstanding reviews, including Golf Digest's highest honor, "Best New Upscale Public Course." Royal New Kent is mentioned in comparisons of Ballybunion in Ireland and Royal County Down in Northern Ireland, two of the finest golf courses in the world. The true spirit of golf has been recreated, and we hope you'll enjoy this tribute to course architecture of the old world. Equal to the standards set by the course, Royal New Kent has first-rate conveniences such as a full-service bar, dining and meeting rooms, practice facilities, and a pro shop. Not far from Providence Forge, Royal New Kent offers terrific views and challenging play for golfers at every skill level. Well-groomed fairways and greens keep Royal New Kent difficult yet friendly, and the staff can offer tips and tricks for playing your best round. Royal New Kent is a terrific choice for your regular rounds of golf or a new destination for you and friends when visiting Providence Forge.